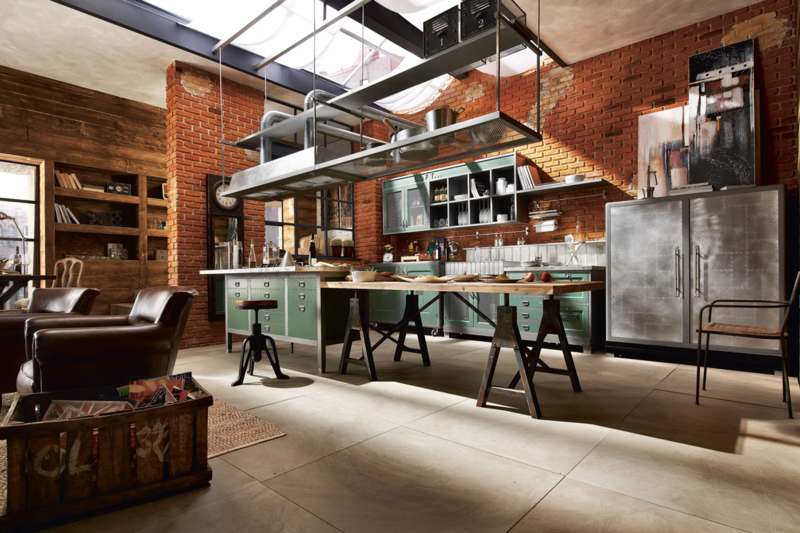 If You were to Renovate your Home again, how Differently will you do it this time? One of the early pain points back in 2000 shaped the way I looked at what are things that I value and do not value nowadays. Back then, my parents bought a new flat and like all for flats they don’t come with much so you need to do the work. My dad was especially looking forward, since for people their generation, big homes equate to wealth or you have made it. Being a contractor, he proceeded to renovate our home. I learn later that the total cost was $30,000. Now a $30,000 renovation nowadays may not seem like a lot, but back then it was definitely not the baseline cost. Looking back, it was a double whammy because when you work on your own home as the main proprietor of your business and also the main worker, you are losing valuable income because you are not working. Not that it matter considering the construction and renovation industry was so bad that there was no job. So we got a nice 5 room flat with nice renovation and no cash flow coming in. For 4 adults living in there, I always felt a 5 room was excessive, especially if you are doing the cleaning (post irobot days!). A 4 room would be cheaper, less to clean, plenty of rooms to go around and more government handouts! This haunted my idea of property for the longest time and took me a while to work it out of my system. I didn’t ask my dad but from the head butting we did over the years, I realize how much the home means to him. I think he is not alone in holding such a high emotional value to a home. Many people do. There is this autistic part of me that looks at the home as a hotel. To me, as long as you give me a table, my laptop and a bed, that is all that I need. I think it’s because I do not own it. I put myself in a position that if I bought it, I might have made the same decision as my father. Being in the company of many peers who have secured their first home, this have been a big topic of discussion. I thought I will pen some thoughts. Ask a financial writer and more or less you won’t expect me to not talk about the monetary side of things. I hope that I could share how I look at things, but also what I learn from my dad, who was a contractor. If you do not have scarce resources to work with, then you can continue to read but please do not be infuriated by what I have to say. Here are some of my perspective on things. When they know that they are going to get the keys to their first home, not everyone starts of thinking: What is important to be in our home? That question to me, will drive a lot of the cost required for the grade of renovations and furnishings. Without knowing the important stuff, what may end up happening is that the couple gets lead around by their interior designer, or contractor into dark alleys on considerations that are very low in the couple’s priorities. On the same note, if you do not have a good grasp of the big picture, you may spend most of your capital on the renovations, and leaving little for the furnishings. This means that you have to come up with more capital. The guy at Early Retirement SG shared his recent experience of moving into his new home. He has managed to keep his total expenses to SG$18,000. We moved up in life. We get disassociated between what is necessary and what belongs to a rich life. Why that happens is because the society, your peers have built a culture that these things are the norm. If you do it otherwise, you are so out of place. And not many of us wants to be seen as the odd ball. It didn’t occur to me that we have moved up so much that built in cabinets are the norm. It is only when I helped out my good friend on his wedding that I realize his wife’s in law’s place was the traditional off the shelf cabinet with stove on top. Look wise, it does not look best. I thought it gets the job done. When you are tight on money, this becomes a consideration. What is worse is that for many, they don’t even cook actively anymore. 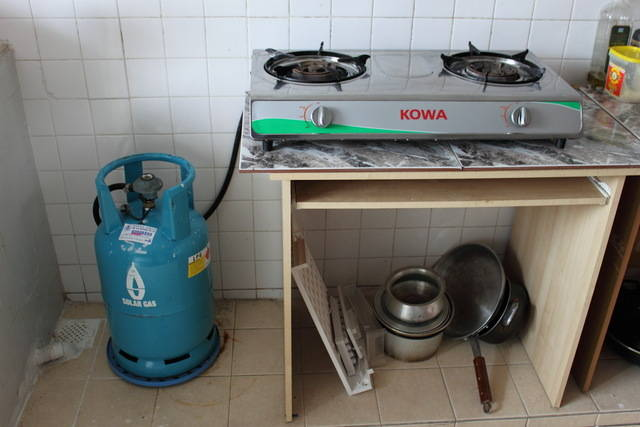 The stove is used to heat up food and boil water. We also don’t want to spend our leisure time reading a book or watching shows in our kitchen. Yet we spend a ton of our money on it. However, I realize even for myself, I find it challenging not to custom made the kitchen cabinets and to buy them off the shelf. This is because my friends will find it weird when I invite them over for housewarming. Mr Early Retirement SG also brought up an important point that we tend to focus a lot on customizing the home to look pleasing instead of functionality. In his case, much of his focus is on ensuring the needs were fulfilled, that functionally the home serves its primary purpose. I summarized his cost of $18,000 in the above table. 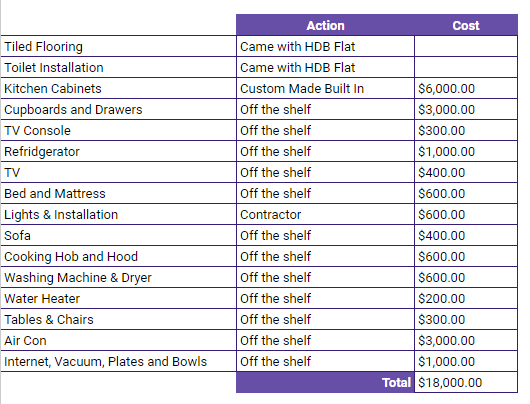 If you are short on cash, opting for the furnishings that comes with the HDB flat would allow you to pay for these furnishings with your CPF instead of paying out of the pocket money from your disposable income. Indeed I missed the cost of furnishing up the home with off the shelf items when I chat with my peers. They would say that their total cost was $50,000 and I was taken aback because I remember they kept their budget to $30,000. Turns out the bare minimum items to make the home livable cost a fair bit of money. Getting the home ready to move in, so that it is livable can be a stressful event. So much so that people would prefer to do it once. Even if we do not have the cash for it. In the old days, we have limited money, and we just add on to the home when cash flow is becoming better. This is often forgotten by this generation. You could do up each sections on your home to your liking if you split things up. Renovate and furnish to a livable baseline, then when cash flow is better, do things up more beautifully by sections. Sometimes, doing this has an advantage because, over time, you might lost interest in further beautifying , because, you realize there are other more important things you could spend money on. To make the home a livable baseline, you should do the things that, if you do it next time it will be disruptive. These would include the water piping, all sorts of pipping, additional electrical power cabling, air condition piping, floor tiling, painting. Because in the future, some of these renovation projects tend to be constrained, the disruption could be 1 week in 3 to 5 years. That is a small price to pay for what you deemed an upgrade to your living conditions (if not why are you doing it?). One week passed by in an instance. This is not wrong. At work projects usually have unforeseen costs. The important thing is that, like work projects, you need to have a buffer expense for it. What this means is that, ideally you would like to spend $30,000 on your renovations. However in terms of capital required for renovations, you should have an extra $10,000. I seen friends getting frustrated of these cost overruns that they have to borrow from their parents (if the parents have the capital) or take out an emergency renovation loan. Your Budget Estimation will also need to be Fundamentally Sound. What do we mean by fundamentally sound in this instance? I had one friend who tried to squeeze a lot of his requirements because he has only $18,000 to work with. Even without an estimation, we know that a budget of $20,000 and below is tough. If you have more things that needed to be done, that shoe string budget is not going to cut it. There are a few requirements that have to be done for your family and those will take up much of the cost. The problem for many is that, renovation and furnishing is new to them, and what may be a lot of money to them, is actually very little in today’s market. What are each of the things that you need to do, be it amendments, installation and furnishings to buy. Put them in a spreadsheet. With this, you have a realistic idea how much your ‘Dream’ is going to cost you and your spouse. For some frugal folks you may realize your bare minimum needs do not cost that much as you anticipated. However for most, you realize you need a bigger sum of money, or you have to seriously consider where to scale down. Doing this will manage your own expectations as well. If fitting a constrained budget is a priority, then a contractor would be the way to go. However, there is a caveat. Interior Designer have the experience to provide you with a theme and direction to renovate your home so that, it feels more like a home! If you let someone like Kyith to do this for you, you will not have a comfortable setting to come home to at the end of a hard days work. The Interior Designer also act as the project manager, controlling the schedule of the project, linking up the various parties. This to me is a big part of why you are paying for an Interior Designer over contractor. For some of us with busy work lives, or bad at linking up with people consistently to push through difficult project execution, or just don’t want this piece of work, working with an Interior Designer over a contractor alleviates this from sapping up your time and energy. However, there is a question about the quality of who you work with. This is why most of these business is still based on word of mouth and validation from your peers. Even then, their quality (read their management, quality of work, getting the right results) might differ from project to project. My dad used to tell me some of the most horrendous home he saw was when the owner can’t really design and come up with all sorts of weird color. They don’t realize that the weird color have to factor in the color of the furniture they bought. I am particularly bad at this, and its not a competency many are good at, which is why we differ to an interior designer. 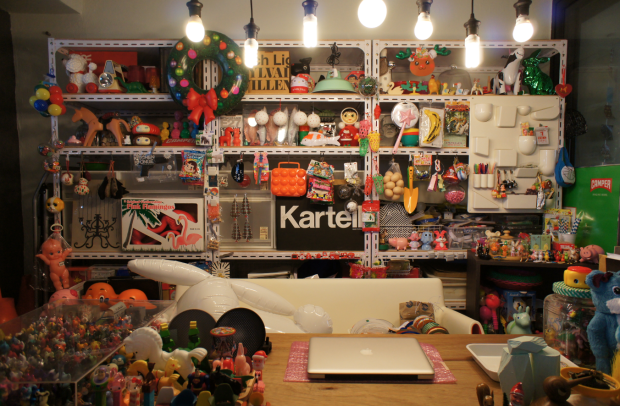 However, I reckon that, if you are tight on the budget, the aesthetic portion is a good to have but not too important. You can have a middle ground, which is trying your best to plan that out on your own. The worse case isn’t always that bad, since its just a repaint or changing certain furniture next time. It occur to me rather late having different layers of lighting creates a good effect. This, together with the tone of your paint and decorations can be the life in your home. The character of the people in the home also inject life into the home. I also realize how seductive a good photography is. Had I took this picture instead, this home will look more like a store room (perhaps that is why many friends was disappointed with the end result, even when the designer shots look good). I seen folks borrow money to renovate their place. I read that as not having a lump sum saved up for something that they should be prepared for. Or that they are living it up by doing some thing extra so that the home is a comfortable place to back to after a hard day of work. Renovation loan have relatively high interest, but still much lower than credit card debt. You should pay it off as fast as you can because the interest is rather formidable. However, by borrowing to beautify your place, you are removing money from your future self, taking away money meant for something you do not know now. All debts are like this. And with a debt, it stops you from quitting your job because without a job, you cannot service that loan. I asked my dad, whether there are something that we definitely need to do, if not we cannot live in our HDB flat. What he said was that, in modern HDB, there is really not a lot. Even the cables are wired much better than it used to. What this means is that homes come serviceable to live in. If you need to borrow to make the home comfortable so that you can enjoy it, make sure you do not have to overwork to repay the loan. Or be super stressed that even if your home is so beautiful, you won’t even notice it. How much would you notice in 10 months, then 10 years? Deciding on the appropriate actions to take in furnishing a home means you have to come up with some hard decisions between yourself and your spouse. Often we became paralyzed or get into a grit lock, because both choices that are available to you have the same pros and cons. Perhaps we should look at things on a longer time frame. It will help tilt our decision to one side. This was the 10-10-10 Rule that Suzy Welch (wife of Jack Welch the former GE CEO) came up with. Suzy use this to sought out some of the tough decision in her career and personal life, with that being her divorce. It means asking how the impact of your decision will be in 10 minutes, 10 months and 10 years. When we are stressed by daily decisions, everything looks urgent and something necessary that have to be done up. However, if we asked ourselves what is the impact of us doing or not doing some custom furnishing, buying some things over another we might gain a better perspective for us to move to a right decision. For example, the decision to extensively do custom made cabinets. On a 10 minutes basis it does look satisfying. 10 months in, when you settle in to the daily routine of life, you might realize that you don’t notice how the better grade of cabinets impact your life. 10 years in, you might not stay in the place any more, or that like most things made today, they have lost much of its luster to wear and tear. If we do not consider the cost of the home purchase, the renovation and furnishing are one of the biggest lump sum spending a couple could make. It pays to think about whether the way you furnish up the home matches to your value system. If you are like me, doing up excessively its not gonna create a lot of happiness because I value not being encumbered. A tolerable home is a nice home. If your value system demands a good looking home, you have to be prudent and flexible as well, and not succumbed to unrealistic expectations. Do let me know, on hindsight, whether you would do MORE, given your better earning power. I do have peers who have this trained of thought. While we are on this topic, has any of you NOT custom made your kitchen cabinets? What made you go down that direction? Your parents and your grandparents are products of rental generations.Landlords were the rich and wealthy ones. Even when LKY started home ownership for the masses; many of them still couldn’t afford to buy their home. Look at the number of 1 or 2 room rental HDBs in Toa Payoh; Bukit Merah, Bukit Ho Swee, etc. When your parents generation finally could afford to buy their home; they were proud of their achievement. Symbol of success! Many younger ones nowadays. To them home is a place to stay or just another investment asset. Symbol of success for owning a home? May be for some of those married couples planning to LIVE in their home for their lifetime. Ask around how many of the younger ones are proud of their ownership? Agree with CW8888. Different generations have different values. Having lived in a first generation 1-room flat with communal toilets of 8 cubicles shared by 40 households in each floor in a 6- storey walk-up building in Jalan Tenteram, we viewed many things differently. Today, the esprit d corp of neighbours are very different. Now, everybody prefers closed doors. Then, deprived of many comforts of life in our homes, we tend to come out and socialise. Then, most of us had no TVs, fridge, and even sofa sets to begin with. Anyone with TV will share it with the neighbours. Children will flock to a household with TV to watch. Corridors were communal space for children to play. Women will gather in each other’s kitchens to chat while men-folks will be too busy at work to bother. The picture above is indeed a home of wealth. My 5c opinion. hi Fred, wow you really have some of the oldest history. I think in the old days there is more communial spirit. However, sometimes i wonder would such a place accommodate a secluded boy like myself. Thanks for mentioning my article on your blog. I never really thought about renovation til I got my own place. And when I got my own place, my wife and I had always the same idea that we would just buy most of the stuff off the shelf, cos our parents did that. We were quite amazed/stunned that most of our neighbours did not bat an eyelid to spend upwards of 20k. Furthermore, we were the only couple to have done almost no reno. Very strange in my opinion cos I remember my grandparent’s home and my parent’s home never did much reno. So I was wondering when did the new generation decide that getting big renos were the norm. hi Early Retirement SG, perhaps you are not in tuned with the housewarming culture and have a group of people you eat with. If you do, you will realize this is the norm. I was wondering why you would do custom for the kitchen. is there a specific reason? Haha, most of my housing decisions came about from my experience with my parents and grand parents place. They both had built in kitchen cabinets. I was quite surprised when I saw your picture of the shelf and cooker. I never had that mental picture in my mind so never even considered it. I wonder if I would have considered it if I had known about it. But it’s hard to think about it now, cos since I’ve in-built the kitchen and lived with it so long, it’s hard to think about living with something different. I’ve been to house warmings. Just that I never really bothered to look into the decisions people made. Like if they showed me the bedroom, I would be like, ok bedroom… I didn’t explicitly notice it was built in cupboards, or the built in TV console or whatever. It was only when I did my own house reno that I realized/noticed the difference in values. the value is big isn’t it? sometimes i wonder, perhaps i was wrong that custom build does not differ that much and you get some customization. then i look at some of the cupboards they cannot be that expensive. one can think of buying one, then it spoils, then buy another, and it might still be worth it. I guess you are really influenced by family traditions haha! I spent 5k+ on my kitchen. If bought off the shelf probably could have done for half the price I think. There are some plus points. The custom kitchen fits nicely end to end, contractor silicon seals the corners and sides of the cabinets. Considering it’s a food prep area it tends to get wet or food drops around the place. With the silicon seal, I don’t bother about food or water dropping behind the cabinets. So I don’t need to clean behind and under the cabinets. I have hanging cabinets as well. Not sure if those could be gotten off the shelf. Hi Early Retirement SG, you can have bottom and top cabinets. i have one in the past, but it doesn’t go real high. my take is similar to what you think, its a small area and you have to make full use of it and thus with off the shelf cabinets you might not be able to achieve that. I wanted to reuse many of the kitchen/bathroom fittings. I wanted to repair/reuse kitchen cabinet doors, etc… I also wanted to re-plate chrome of my bathroom accessories to reuse. 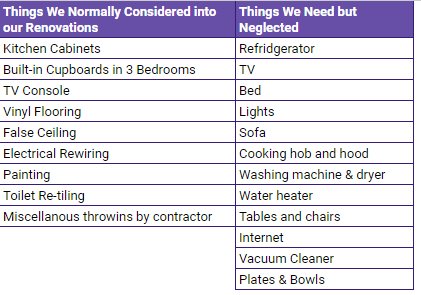 Basically, I wanted to repair/recycle parts of the renovations done earlier and onlt replace sinks that have cracked and part of cabinets that have rotted. No interior designer/contractor was prepared to help me! I did not even discuss with them about the price of the jobs yet. This is the situation in Singapore nowadays. Most (if not all) handyman/contractors only want to hack everything when it comes to renovations. If anyone knows a contractor who appreciates reusing/updating, please provide me their contact. This is sad. This is why the culture might be different over here. There should be contractors who do small work. It is disappointing that they would not negotiate. You need to find someone you know, or someone that does these niche services. but to be fair, we got to ask, if they do these niche services how much should they charge?